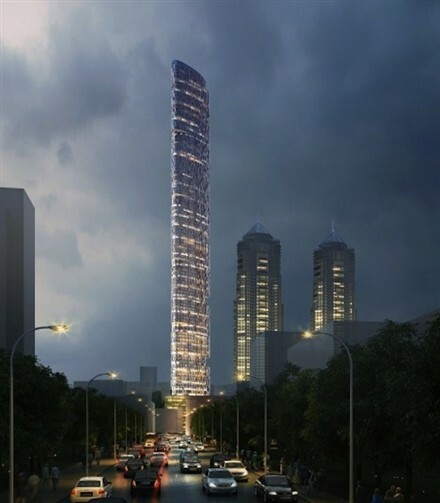 Adrian Smith + Gordon Gill Architecture has unveiled its competition-winning proposal to build Mumbai's tallest skyscraper. The 400-metre-high, 116-storey Imperial Tower would become the tallest building in the Indian city if construction goes ahead. The tower would have a slender, aerodynamic shape designed to "confuse the wind" and withstand strong currents, according to Adrian Smith + Gordon Gill Architecture. Green terraces called "sky gardens" would also break up wind currents, say the architects, whose kilometre-high Kingdom Tower in Saudi Arabia is currently under construction. The proposal includes plans for 132 residential units, some as large as 1,115 square metres, along with smaller serviced apartments.